I’m recovered from work and my paddling vacation! I’m ready to share my food and adventures with you! It would be easy to let this blog die if I didn’t hear that so many of you do really enjoy reading it. 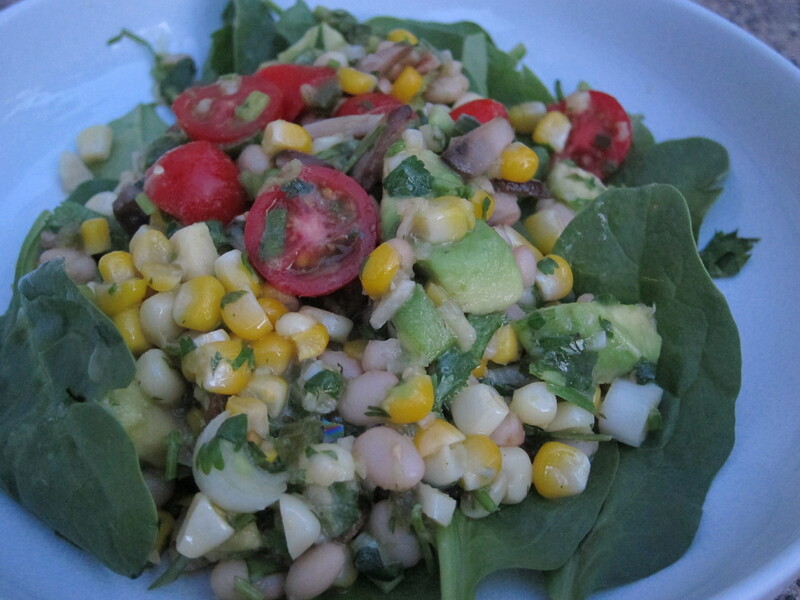 Need something else to do with all the fresh autumn sweet corn? Eating it off the cob is messy, and doesn’t travel well. This is my favorite corn based dish. It’s so simple it would be easy for it to be boring. It’s primarily corn and avocado. Yummy yes, but not drool worthy make me crave it, make me want to share it. This salad hinges on building flavor that makes it feel like a meal. 1 can small white beans or pearled barley or something for more meal like substance. Theoretically you could make this salad with just the first list of ingredients. But I swear it’s ten times better with the last five flavor boosters. This description gets long, so the simple instructions are at the bottom. Prep your corn. Remove husk and silks, cut off the cob. I cut it into a large bowl that I’ll use for the salad later. If you’re going to use a grain, start cooking it now. Chop mushrooms small (you want them to essentially disappear into the dish, no one will know they are there but you). Heat pan on medium-high and add butter and oil (enough to get the mushrooms good and moist). Fry up mushrooms, add just a dash of salt. They should not just steam and get soggy looking but actually get toasty looking. If they just get soggy, either you over filled the pan, the pan walls are too high, or you weren’t aggressive enough with the heat. Mince garlic (or crush, whatever). Add to pan, reduce heat to medium (garlic burns easily). Chop and add jalapeños if you’re using them. Once the garlic is toasty add the white wine and miso paste. Stir up to mix in miso. Add corn and stir. If it’s looking really soupy and wet, leave the cover off and maybe up the heat. Otherwise cover and let cook a bit. I like letting the corn get warm and just start to cook, but I like them with a good fresh crunch. In the big glass bowl, the zest of one lime and the juice of two with a pinch of salt. I use the back of a spoon to really ream out the lime and get all the juice out. Add the chopped up green onion (I use the white and green part), and chopped up cilantro (stems and all). Add roughly diced avocado and mix well into the lime stuff. If using beans or grain or whatever, rinse it. You don’t want starch or bean goo all over it. Add to the corn mixture and turn off the heat. Let it cool down a bit (I never let it cool all the way down, no patience). Stir in to the avocado lime mixture. Taste and add salt or pepper as desired. I like to mix in halved little tomatoes, partially for color, also because they are yummy. I like to serve it over baby spinach. Sometimes I mix it in. It lasts a couple of days in the fridge. The avocado grays a bit, but not too bad if there is enough lime in it. You could do all sorts of stuff with it! It was dusk on a late summer evening, but I got the last light of the day for the photo. – Prep corn. Start grain? 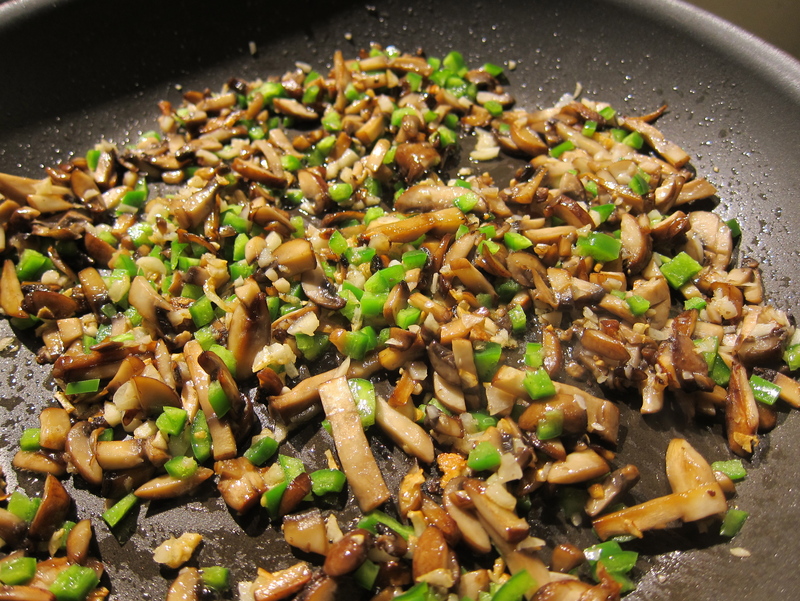 – Chop and fry in butter and oil: mushrooms, garlic, jalapeños, in a bit of salt. – Add white wine and miso paste. Add corn. Cover? 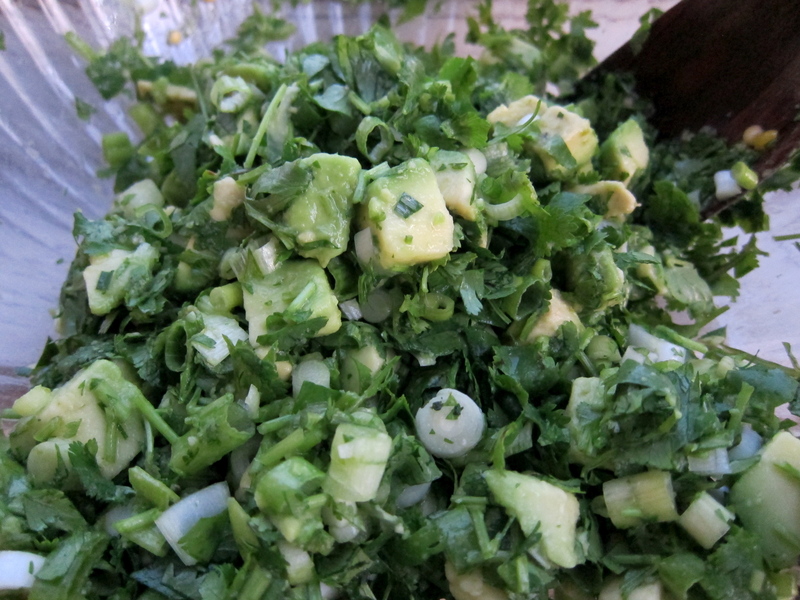 – Mix in big bowl: zest and juice of limes, chopped cilantro, chopped green onion, avocado, and some salt. 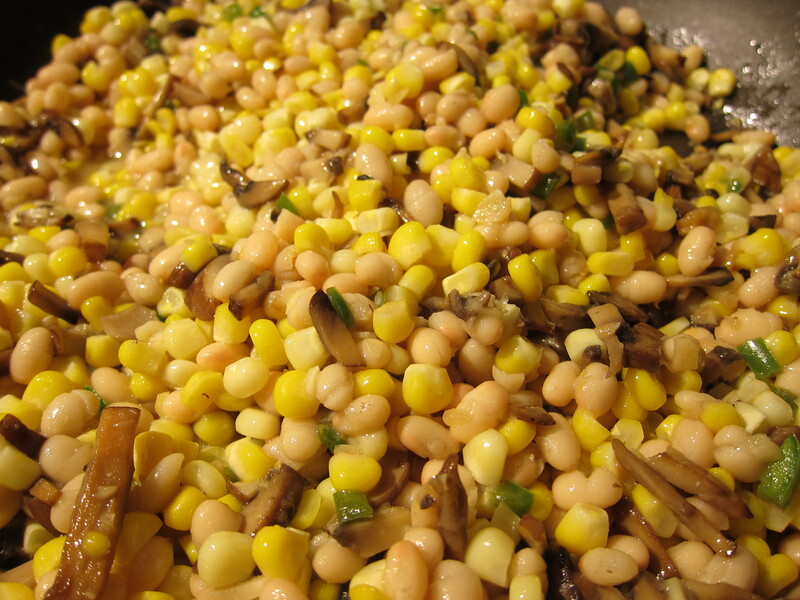 – Add grain or beans to corn mix. – Halve tomatos and mix in to corn? Prep spinach? 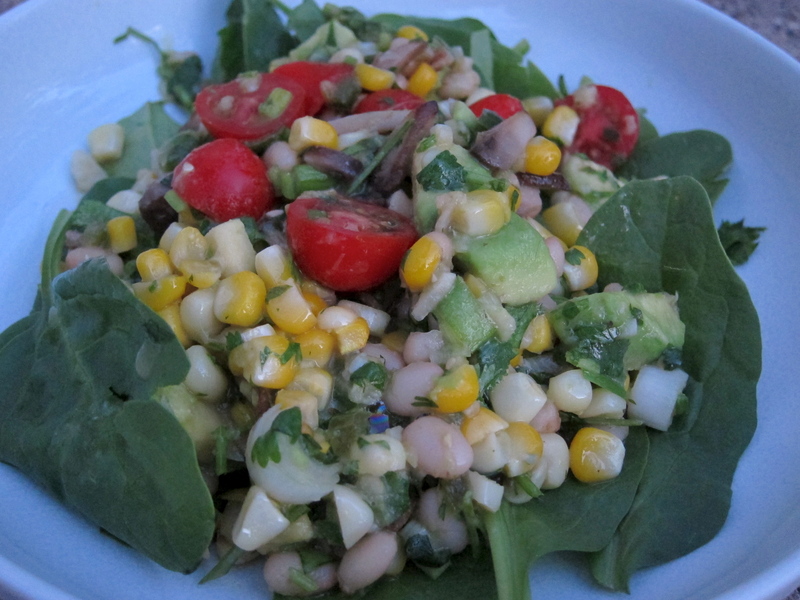 This entry was posted in Kym Cooked and tagged avocado, fresh corn, healthy food, salad, vegetarian. Bookmark the permalink.